Note: Bring all necessary drawing materials and exam pad. Avail Special discounts* for drawing classes. Pre kg to UKG. Rhymes and story telling of your choice.Bring probes for rhymes and story telling. Note: Paper and text will be provided for writing. Children must bring their writing materials. Solo or group performance – come and show your talent on Sunday (6/01/2019) between 10-1 pm. Note: Kindly bring your song in a usb drive. Min duration is 3 minutes. Avail Special discounts* for dance classes. 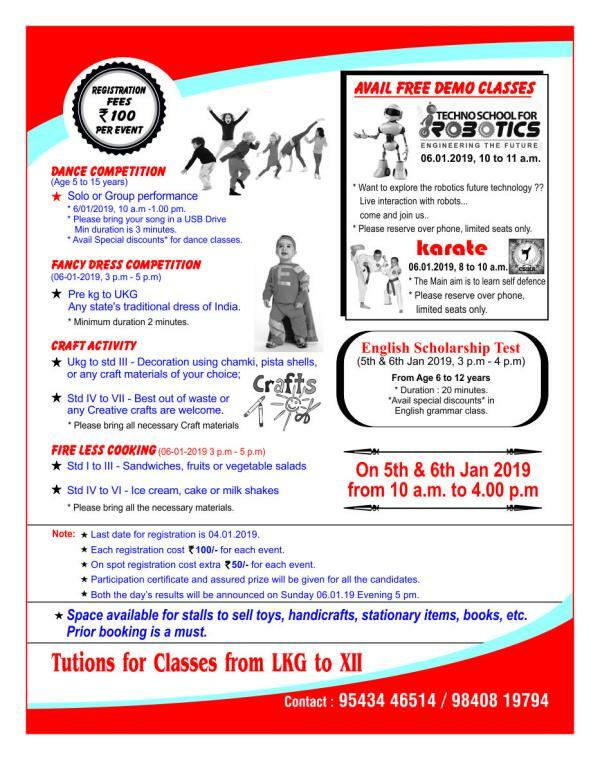 Free demo class on karate available for all age group from 4-15 years on Sunday (6/01/2019). Parents are also welcome. Demo Timing 8-10 am. Note: Bring all the necessary materials. Note: Both the day results will be announced on Sunday evening 5-6 pm. Space available for shops like toys, handicrafts, stationary items, books, clothes etc. Prior booking is must. English Scholarship Test – Duration: 20 minutes. Avail special discounts* in English grammar class. Techno school for Robotics – Free demo class on 6/1/19, Sunday. Parents and children are most welcome. The main aim is to enhance the interest in Mathematics, science and technology. Timings: 10-11 am. Please reserve over phone, if interested. Limited seats only. Brain gym – Improves memory, concentration and confidence, helps manage emotions, relieve stress, and develop good decision taking ability. It helps reduce the habit of watching TV, over usage of Internet, video games etc. Children who have attended the brain gym training show unbelievable hidden potentials. They are able to do reading and writing using their brainwave signals, even with their eyes closed. Handwriting – Cursive writing Training. Guaranteed improvement in just one month. Play school – Montessori based education. Homely environment for the children. Good and safety place to start their education. Nominal fee. Where is the location? I guess it’s not specified? 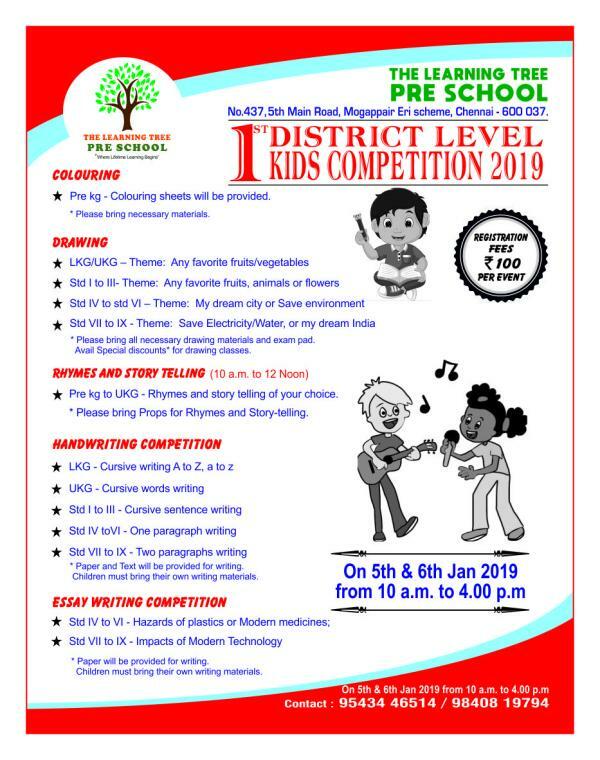 How can we register for the competition…can the kid participate in more than one competition..
Any such competition for Lucknow kids? ?